When Mercedes-Benz announced it was going to launch its first hot hatch most people interested in motoring matters paid attention. And now the German carmaker has unveiled in the incredible A45 AMG which will officially become the world’s most powerful hot hatch production car. 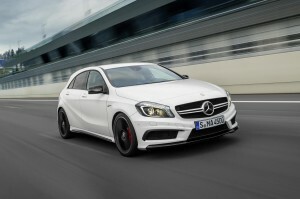 This really is a car for a new generation of Merc lovers with a lot of car in the compact class. OK so it’s going to cost around £36,000 but it will reach 0-62 mph in 4.6 seconds with its 360 bhp engine. The A45 AMG will also take on the BMW M135i and the next generation Audi RS3 in a sector that the carmaker has traditionally steered clear of. Based on the new A Class, it’s the smallest car that AMG have produced – until now it was the C Class. In another first, AMG are using a four cylinder engine for the first time. Forget other AMG versions of the A Class which were just souped-up versions with extra trim and a stiffer suspension – this car is the real deal. The engine is a new unit from AMG and handbuilt in their factory with one bloke working on each engine. Mercedes says it is the world’s most powerful four cylinder and is, technically, more powerful than many super sports cars. The top speed will be limited to 155mph and it should return around 40mpg with its emissions already meeting the requirements being set by the EU in 2015. The A45 AMG will make its official debut at the Geneva Motor Show next month and should be on sale (or available for leasing) in the UK from July. This entry was posted in Car Updates & Releases, Luxury Cars, New Cars, Small Car, Sports Car and tagged A45 AMG, AMG, audi, bmw, caption, car, EU, Geneva Motor Show, hot hatch, LS, merc a45, mercedes, MoT, OK, speed, Sport, sports car, UK by Steve Lumley. Bookmark the permalink.